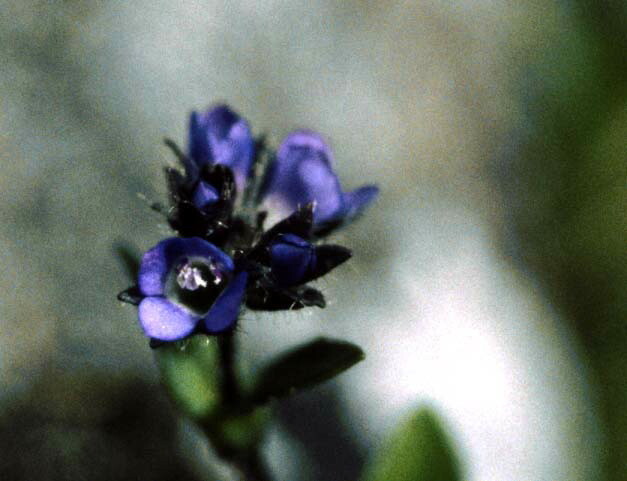 Flora of the Canadian Arctic Archipelago - Veronica wormskjoldii Roem. and Schult. Veronica wormskjoldii Roem. and Schult. Published in Veg. Syst. 1: 101. 1817. Synonymy. Veronica nutans Bong. Mem. Acad. Petersb. 2 ['Veg. Sitcha']: 157. 1833. ?Veronica wormskjoldii Roemer and Schult. var. nutans (Bong.) Pennell (1921), Rhodora 23: 15. 1921. Vegetative morphology. Plants 7–15 cm high (to 35 cm high in continental North America); perennial herbs. Only fibrous roots present. Ground level or underground stems horizontal; rhizomatous; elongate (branching); 0.5–1 mm wide. Caudex absent. Aerial stems erect; not filiform. Aerial stem trichomes present; spreading. Leaves present; distributed along the stems; opposite; dying annually and non-persistent. Petioles absent. Leaf blades simple. Leaf blade bases cuneate. Blades (8–)10–20(–25) mm long, 5–8(–12) mm wide, spreading, oblong, flat, veins pinnate or appearing single-veined. Blade adaxial surface glabrous. Blade abaxial surface glabrous. Blade margins entire, glabrous; apices acute. Reproductive morphology. Flowering stems with leaves. Flowering stems hairy. Flowering stems pubescent, or pilose. Flowering stem hairs simple; white or translucent (at base), or transparent with deep purple cross-walls (near the inflorescence); glandular hairs present. Inflorescences racemose; terminal; dense; globose or sub-globose; 0.5–2 cm long; 5–10(–12) mm wide; elongating as the fruit matures (very slightly, e.g., CAN 268937, fruiting inflorescence 3 cm long), or not elongating as the fruit matures (CAN 98730, inflorescence 2 cm long; not interrupted in fruit). Pedicels present (but short; 3–6 mm long); with non-glandular hairs. Flowers per inflorescence 3–7; small, or medium-sized; bilaterally symmetrical (zygomorphic) (slightly). Sepals conventional; 4; fused (at base); 2.2–3.2 mm wide; green. Calyx funnel-form; 4-lobed (deeply so); hairy. Calyx hairs villous; glandular; white or translucent (with brown or purplish cross-walls). Calyx margins ciliate. Petals conventional; fused; 4; blue; 4–5 mm long. Corolla rotate (to campanulate); 4-lobed (lobes somewhat unequal). Stamens 2; stamen filaments glabrous; fused to the corolla. Anthers triangular (elliptic); 0.8–1 mm long (inconspicuous). Ovary superior; carpels 2; syncarpous. Ovaries ovate; hairy; puberulent, or villous. Ovary hairs brown (glandular). Styles 1; 0.9–1.1 mm long; straight; basal portion with hairs at the base. Placentation axile. Ovules per ovary 20–40. Fruit with calyx persisting; dry; a capsule; ovoid, or obovate (sometimes retrorse at the apex); brown, or purple; 6–7 mm long; 3.5–5 mm wide; hairy; surface venation reticulate (small veins), or venation ribbed (large veins); dehiscent; opening with teeth at the top of the capsule (4-lobed units that do not split to the base); teeth 4. Seeds 20–40; 0.5–0.8 mm long (with a hilum more than 75% of the length of the seed); white; surfaces smooth. Chromosome information. 2n = 18 and 36. (2n) (2x ) = 18. For the collective species. Pojar (1973, western Canada). (2n) (4x) = 36. Böcher and Larsen (1950, Greenland? ); Löve (1954b); Jørgensen et al. (1958, Greenland); Löve and Löve (1966b, northeastern USA). Ecology and habitat. Substrates: snow patches, along streams; imperfectly drained moist areas, seepage slopes; moss; with high organic content. In wet mossy places by brooks and on snowbeds" (Porsild 1957). Fairly common in herbmats on 4 of 6 "flower slopes" (CAN 284050). North American distribution. Alaska, Yukon, continental Northwest Territories, Nunavut Islands, continental Nunavut, northern Quebec, Labrador. Range in the Canadian Arctic Archipelago limited. Rare. Low Arctic. Arctic islands: Baffin. Northern hemisphere distribution. North American. West Alaska, North Alaska  Yukon, Central Canada, Labrador  Hudson Bay, West Greenland, East Greenland. General notes. If subspecies are recognised, the specimens from the Canadian Arctic are subspecies wormskjoldii. Hultén (1968b) recognised two entities in North America: the wide-ranging subsp. wormskjoldii from Greenland west to Alaska, and the Cordilleran subsp. alterniflora from California to Alaska where it reaches the Arctic in the Brooks Range. These were not accepted by Cody (1996). Hultén synonymised Bongard's V. nutans with subsp. wormskjoldii. However, after a ploidy variation was documented in the 1960's, Löve and Löve (1975) separated the northwestern American plants as a diploid V. nutans from the northeastern American tetraploid V. wormskjoldii s.s. They did not mention the 'alterniflora' entity, and it is not clear whether all the northwestern American plants belong in their V. nutans. "(a) As an eastern and western species. 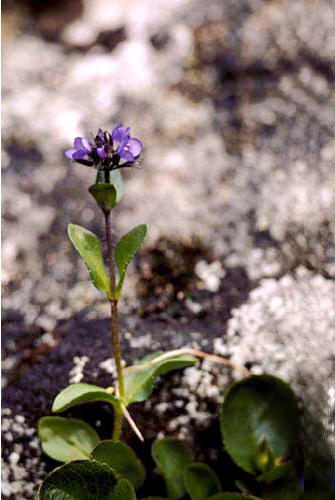 Veronica wormskjoldii, restricted to Greenland and eastern Canada, and the western V. nutans, found in western Canada and Alaska. The western species would include both subsp. alterniflora and the western part of subsp. wormskjoldii in Hultén's meaning. (b) Similar to the above, recognising two subspecies: subsp. wormskjoldii, the eastern entity; subsp. 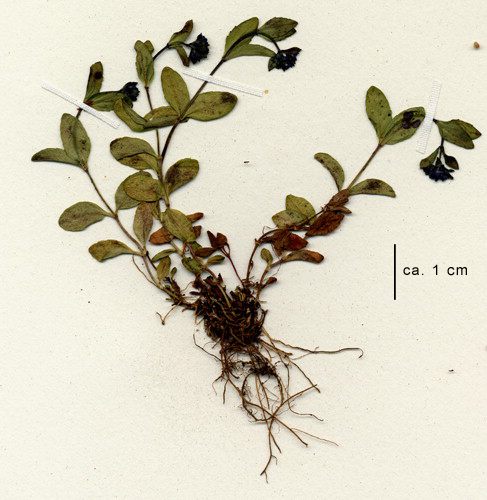 alterniflora (with the 'nutans' names as synonyms), the western entity. Elven et al. (2003) felt that both solutions (a) and (b) neglect the morphological variation found among the western plants. (c) As Hultén (1968b), with a wide subsp. wormskjoldii and a Cordilleran subsp. alterniflora. Such a solution probably neglects the ploidy difference between eastern and western plants. (d) As three entities, perhaps represented by the names 'wormskjoldii' (eastern tetraploid entity, Greenland typification, Canada and Greenland), 'nutans' (western coastal, perhaps diploid entity, southeastern Alaskan typification, ALA), and 'alterniflora' (western Cordilleran, probably diploid entity, Canadian Rockies typification, ALA)." Illustrations. • Base of plant. Plants have long slender rhizomes. Greenland, Kangerssuneq qingordleg. CAN 311579. • Close-up of plant. Plants with opposite leaves and compact terminal inflorescences. Nunavut, Baffin Island, Ogac Lake. L.J. Gillespie 6752, L.L. Consaul, and R.J. Soreng. CAN 583022. • Close-up of plant. 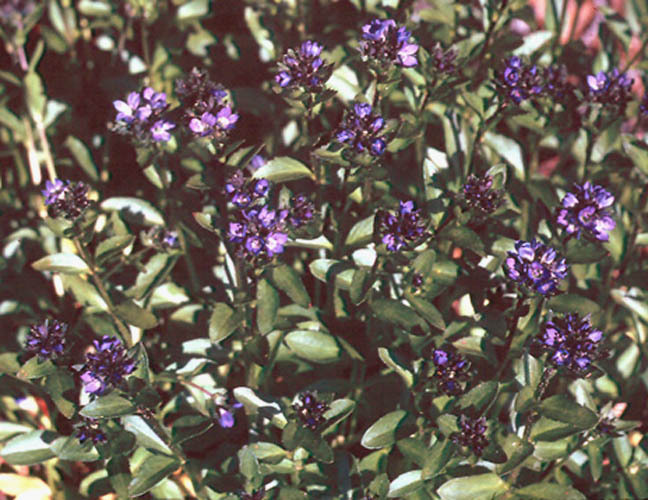 Plant 7–8 cm high with a long stolon at the base of the stem, simple opposite leaves, and blue flowers in a sub-globose inflorescence. Nunavut, Baffin Island, Ogac Lake. L.J. Gillespie 6752, L.L. Consaul, and R.J. Soreng. CAN 583022. Photo by L. Consaul. • Close-up of flowers. Flowers clustered at the top of the stem. Note the four petals are deep blue in the upper part and white where they are fused at the base. Nunavut, Baffin Island, Ogac Lake. 1962. Photographed by Ian Mclaren. • Close-up of flowers. Flowers clustered at the top of the stem. The sepals and the leaves subtending the inflorescences have long hairs on the margins. Four petals are deep blue in the upper part and white where they are fused at the base. There are two anthers in the centre. Nunavut, Baffin Island, Ogac Lake. L.J. Gillespie 6752, L.L. Consaul, and R.J. Soreng. CAN 583022. Photo by L. Consaul. • Close-up of flowers. Hand-held inflorescence showing the sepals and the leaves subtending the inflorescences with long hairs on the margins. 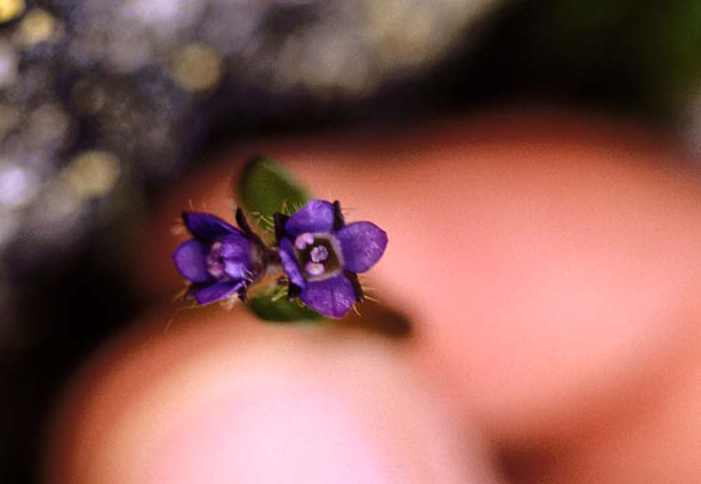 Note the four petals are deep purple-blue in the free portion and white where they are fused at the base. The two anthers are visible close to the petals and the developing stigma is in the centre. Nunavut, Baffin Island, Ogac Lake. L.J. Gillespie 6752, L.L. Consaul, and R.J. Soreng. CAN 583022. Photo by L. Consaul. • Close-up of fruits. Developing capsules with stigmas protruding. Greenland, Angnikitsoq, Itivdlikasik. 30 July, 1966. P. Gravesen and C. Hansen. CAN 311578. • Arctic Island Distribution.